How would you rate Lunia? Hide 93 comments... Click to show. I love your avatar man that santa hat is sooooooooo coooooool :D And guitar i can play a guitar but nvm its so cooooool! Good luck dude :) And welcome! how come i dont get points when i post tips strategies and cheats?? hey man how much it takes to get the $15 they promised? Has a date for the inclusion of trade in Fancoins by Fanbucks? Hello friend I ask you something? Your from UK too ! Do you play crossfire? Hand me your nickname in crossfire? please dont remove my points i really need them i wont spam again promise! Hey dude how are you? Thanks; keep up the great work with keeping the community in check. 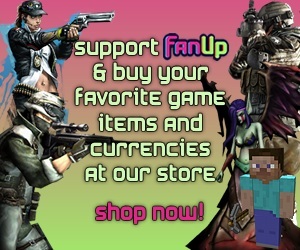 can u tell me how to change fancoins into fanbucks? OK^^ and this new site? Hum you and the owner of the site? Adm Fanbucks as I can? I'm sorry, but i dont speak phillipineese or however you call it :P However, you may refer back in english if you feel like talking to me. Hey Glorum. Just dropping in to say hi! Yeah thats what im doing :P Filtering through content. Great Articles in the LoL section. I re-saved them for you and fan 'em that way others can see it. You should do the same. Bro, come on Xfire? Or are you scared? You know about what. I love your enthusiasm, however i play many of these games and I can tell when something is copy and pasted. I.E. item descriptions from LoL. if you plan to make posts about such items then please put some personal input in there as well. First with the shades. Nice! Would you like to beta test? Oops. Sorry. We have to fix something to allow users to create items. Check back in a few hours.